Oyster volunteers on a ‘wobbly’ bridge! 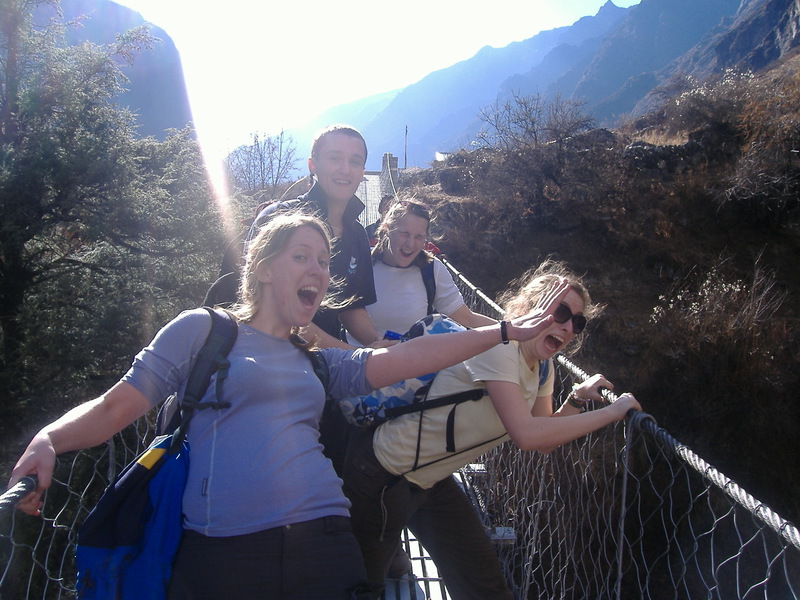 All Oyster volunteers on their gap year in Nepal have the option to take part on a 10 day trek to Annapurna Base Camp. The trek is not designed to be too challenging and has been suitable for all of our volunteers over the years. You will trek to an altitude of over 4000m above sea level during the 10 days. Day 7: Trek to Annapurna Base Camp (4130m); Lunch there. Depending on your plans, we will either take you straight to the rafting initiation point or return to Kathmandu. You will be back in Kathmandu by late afternoon, giving you time to return to the village and your family that day. There is an option to take a short internal flight from Pokhara to Kathmandu. This is a supplement of US$100 per person. O/N with family in the village. We are taking applications now for our September, January and May groups so if you are interested in trekking in Nepal, living with a family for up to 16 weeks and teaching English to your own class, then get in touch with me by email – [email protected] or by phone +44 (0) 1892 771972. For full details visit our gap year in Nepal website.